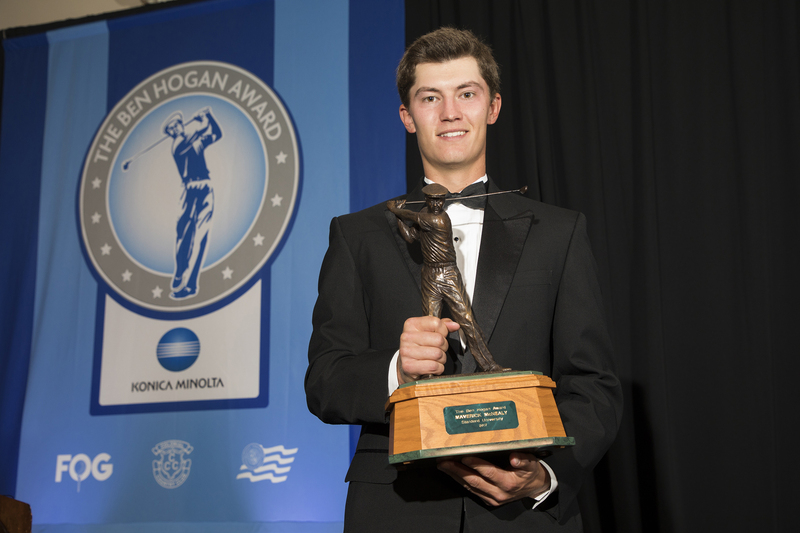 FORT WORTH, Texas (May 22, 2017) – Colonial Country Club, Friends of Golf (FOG) and the Golf Coaches Association of America (GCAA) have announced that Stanford senior Maverick McNealy is the 2017 winner of The Ben Hogan Award presented by Konica Minolta Business Solutions U.S.A., Inc. (Konica Minolta). He is the second Stanford winner in the past four years and is the sixth straight recipient from the Pac-12 Conference. McNealy is one of only two players in the world currently ranked among the top 10 in all four major college and amateur ranking systems. 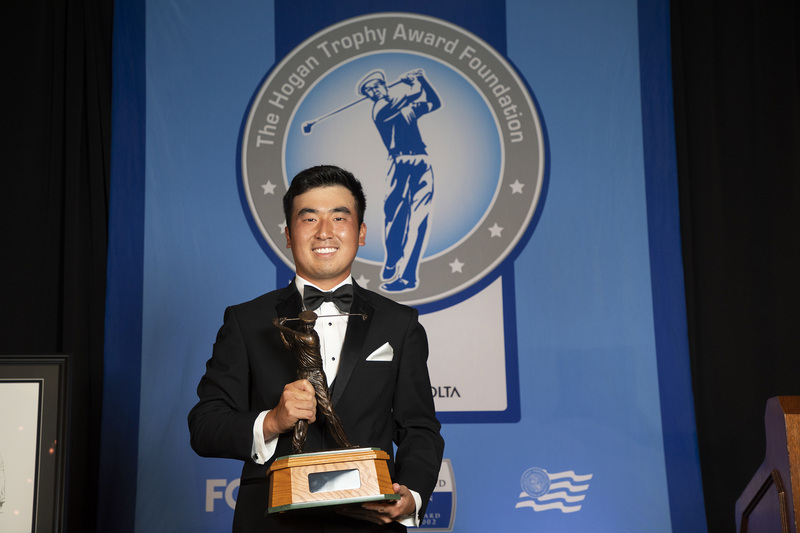 He currently is listed second in the World Amateur Golf Ranking, and was the winner of the 2016 Mark H. McCormack Gold Medal as the year’s No. 1 player. He represented the United States at the 2016 World Amateur Team Championship and has been named to Team USA for the 2017 Arnold Palmer Cup. The senior is ranked seventh in the Scratch Players World Amateur Ranking. The product of Portola Valley, Calif., is listed third in both the Golfstat and Golfweek/Sagarin college rankings. McNealy carries a 69.72 stroke average over 29 rounds, with nine top-20 finishes in 10 events, including six top-fives. His fall victory at the Nike Golf Collegiate Invitational at Colonial Country Club was his 11th career win, tying him with Tiger Woods and 2014 Hogan Award winner Patrick Rodgers for most in school history. Last week, he finished third at the NCAA Stanford Regional with an 8-under-par score of 202. 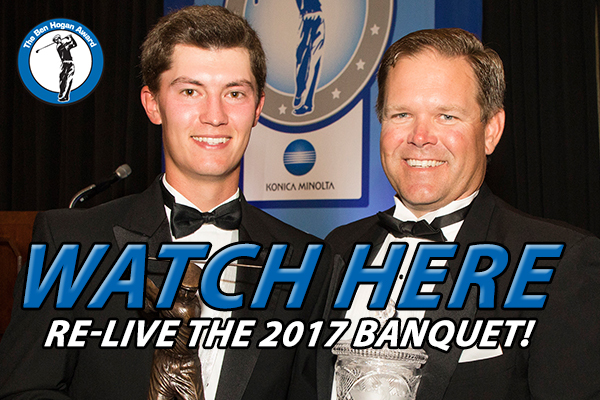 McNealy, who also was a finalist in 2015 and 2016, is the second three-time finalist ever, joining Bill Haas (2002-04). He is the first player to be invited to Colonial as a finalist three times. 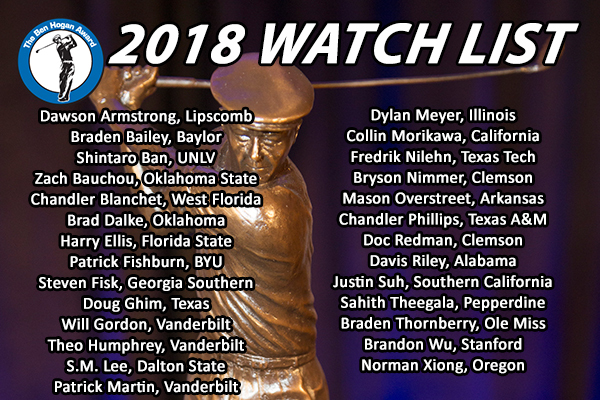 McNealy receives an exemption into the PGA TOUR’s 2018 Dean & DeLuca Invitational, as well as earn a $32,000 grant for the Stanford men’s golf scholarship program. The other two finalists’ schools each will receive grants of $16,000. In all, a record $85,000 in scholarship grants will be distributed to nine schools, bringing the total to nearly $600,000 since 2002. 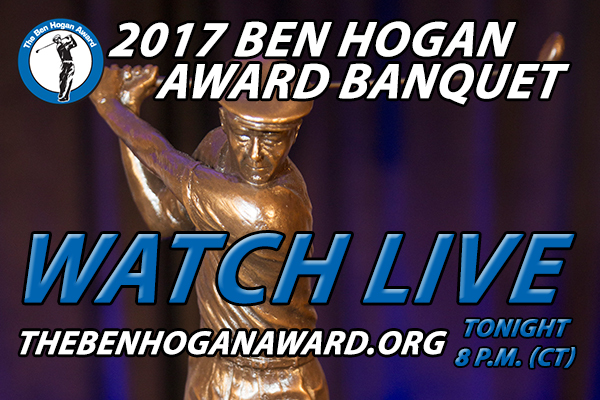 The Ben Hogan Award is presented annually to the top men’s NCAA Division I, II or III, NAIA or NJCAA college golfer taking into account all collegiate and amateur competitions during the 12-month period dating from the previous award’s banquet. 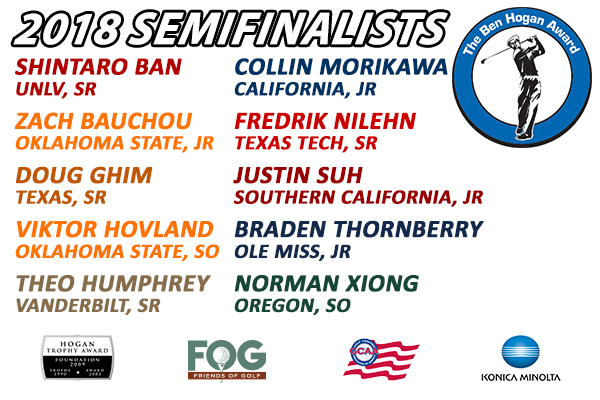 The selection committee, which votes during each stage of the process, is made up of two dozen leaders and experts in amateur, college and professional golf. In order to determine the winner, each committee member cast a ballot that ranked the finalists from 1-3. 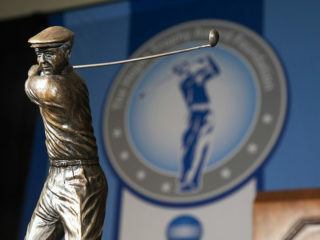 The Ben Hogan Trophy was first issued in 1990 at Bel-Air Country Club in Los Angeles and included academic achievement in its list of standards. 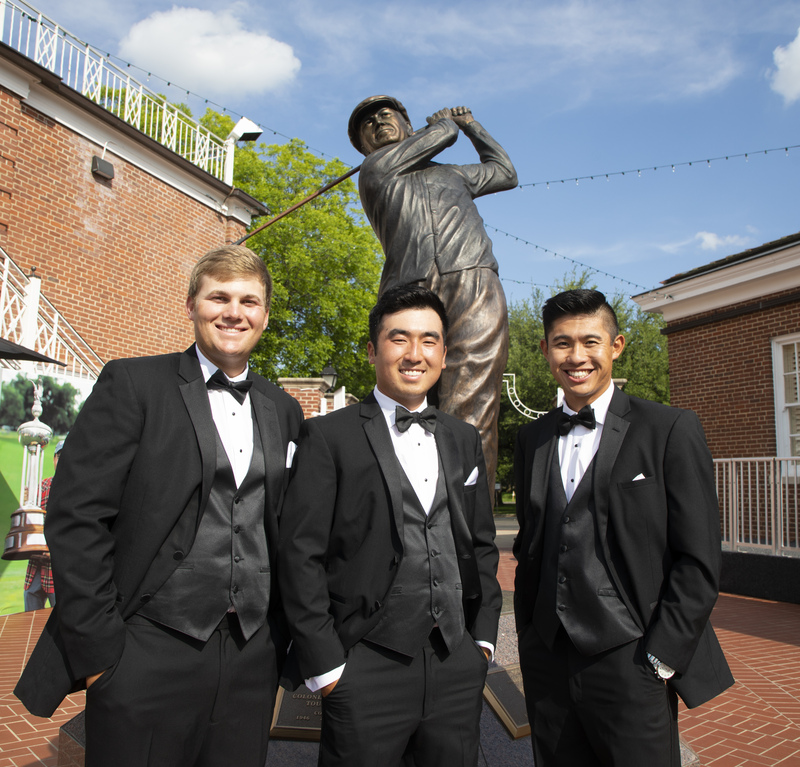 In 2002, the Ben Hogan Award began honoring the outstanding amateur collegiate golfer at Colonial Country Club. Stanford now joins Oklahoma State (3), Arizona State (2), Clemson (2) and Washington (2) as schools with mulitple winners. Winners at Colonial include: D.J. 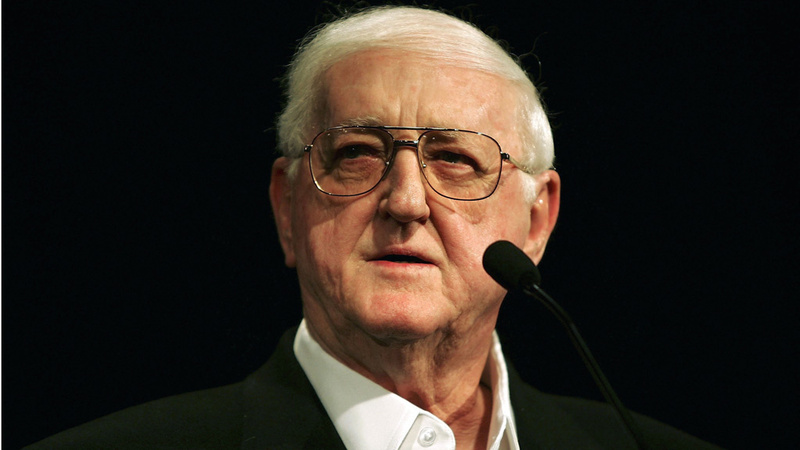 Trahan (Clemson, 2002), Ricky Barnes (Arizona, 2003), Hunter Mahan (Oklahoma State, 2003), Bill Haas (Wake Forest, 2004), Ryan Moore (UNLV, 2005), Matt Every (Florida, 2006), Chris Kirk (Georgia, 2007), Rickie Fowler (Oklahoma State, 2008), Kyle Stanley (Clemson, 2009), Nick Taylor (Washington, 2010), Peter Uihlein (Oklahoma State, 2011), Patrick Cantlay (UCLA, 2012), Chris Williams (Washington, 2013), Patrick Rodgers (Stanford, 2014) and Jon Rahm (Arizona State, 2015, 2016). Konica Minolta Business Solutions U.S.A., Inc. is reshaping and revolutionizing the Workplace of the Future™ (www.reshapework.com). With our comprehensive portfolio, we deliver solutions to leverage mobility, cloud services, and optimize business processes with workflow automation. Our All Covered IT Services division offers a range of IT strategy, support, and network security solutions across all verticals. Konica Minolta has been recognized as the #1 Brand for Customer Loyalty in the MFP Office Copier Market by Brand Keys for ten consecutive years and is proud to be ranked on the Forbes 2016 America’s Best Employers list. Konica Minolta, Inc. has been named to the Dow Jones Sustainability World Index for five years in a row. We partner with our customers to give shape to ideas and work to bring value to our society. For more information, please visit www.CountOnKonicaMinolta.com and follow Konica Minolta on Facebook, YouTube, and Twitter @KonicaMinoltaUS. @konicaminoltaus.